Who is The Bespectacled Mother? Have we ever given a thought to the stories which went behind naming us? As for me, I know my mother’s story and her bit of a struggle to get me the name I am widely known as. I have also written a post about my Name Theory. In case you feel the intrigue as to what is a Name Theory, you are more than welcome to read this post here. I can assure you will have a good laugh. Okay. I know. That was some self-promotion. Coming back to the stories behind the names, Dhruv got his name after the comic character Super Commando Dhruv, the comics I read a lot in my childhood. So much for the thought! Now, what if we lost our name or cannot remember it? Just like in the old Hindi movies when someone loses her memory and asks “Main kaun hun? Who am I?” Similar thoughts struck me when I came across the customized books about a little kid forgetting his/her name. 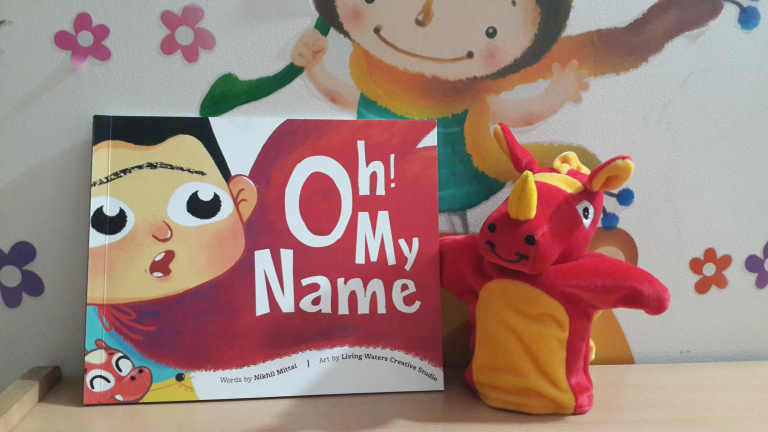 One such book is ‘Oh! My Name‘. A little boy has forgotten his name and is frantically searching for the same all over his house, to no success. Hence, he decides to on a long journey to find his name and, in this adventure, he is joined by a creature called Dabi. 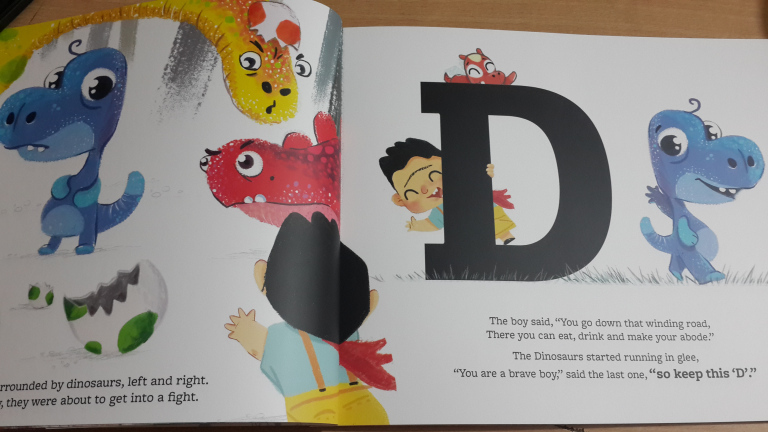 Both, the boy and Dabi meet different animals and characters on their journey. Each animal and character hands over to the boy a letter from his name. At the end, when he collects all the letters, he feels jubilant. However, he wakes up at this moment to realize it was all a dream. He finds a gift kept besides his bed, opening which he discovers the same Dabi and goes back to sleeping happily with Dabi by his side. The provision of dedicating a personalized message to the child. This gets published on the first page. The sing-song style of the lines in the story. The hand puppet ‘Dabi’ came along with the book. The material quality of the puppet is good and it fits perfectly in an adult’s hand to use as a prop to tell and enact stories. 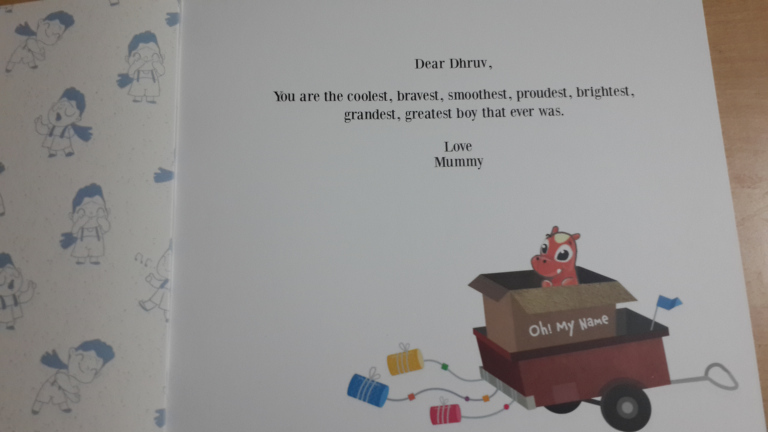 His Mummy’s message for him – lines from one of his favourite book. The puppet Dabi. As soon as the parcel was opened, Dhruv picked it up for playing instantly. The pictures telling the funny stories independently. Why aren’t there animals particularly for letters ‘U’ and ‘V’ when there are specific animals for ‘D’, ‘H’ and ‘R’? You can visit the Oh! My Name website and can create your copy by entering the first name and selecting the gender of your child. You can also see the book version on the site with the details you enter. 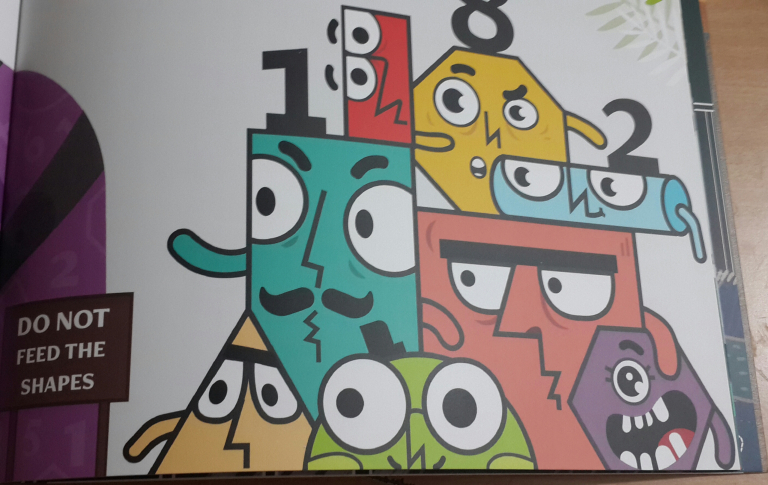 This book earns a Thumbs-up from me and Dhruv, both. It is a perfect gift for your child and for gifting on birthdays. You would not want to not order it. I am definitely ordering one more customised copy for Dhruv’s best friend’s birthday.